The focus for the Yankees in the days leading up to the trade deadline is the bullpen, getting rid of their guys and adding impact arms. First off they must make space for pitchers on their wish list: Eric Gagne, Brad Lidge, Octavio Dotel and to a lesser extent Dan Wheeler, Al Reyes, and David Weathers. In order to make space they must deal at least one of their guys who are clogging up the bullpen: Scott Proctor, Kyle Farnsworth, and Brian Bruney. The same old story is that nobody is too interested in guys who can’t find the plate and the arms they are after are going to cost you a Phil Hughes or a Joba Chamberlain, players who GM Brian Cashman insists are off limits. "You can't hold them all, but certain ones, you have to," Cashman said in the NY Daily News. "It's what you're supposed to do - collect as much talent as you can to help yourself." The lack of good cheap bullpen help is a problem throughout the league. Take the Tigers for instance, they have been interested in Gagne but because of his no-trade clause they figure it is unlikely that he will accept a trade to a team he won’t be closing for. Others around the league may be too expensive and not necessarily worth the prospects teams are expecting. So they, like other teams, are suddenly becoming interested in pitchers they aren’t exactly drooling over. They have had scouts at the Yankees-Royals series and according to the NY Post it isn’t because of Dotel. 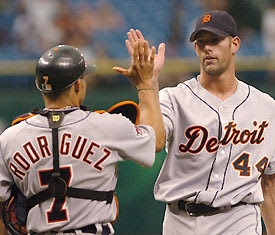 Rumor has it that they are looking to bring Kyle Farnsworth, who played for them in 2005, back to Detroit. There is no word on who the Yankees might want back in return or who the Tigers are willing to offer, but for the bombers the deal makes sense – addition by subtraction. By getting Farnsworth out of their bullpen they can make a trade for another reliever or call up one of their own. At the very least they’ll get rid of a player who gets booed every time he pitches at Yankee Stadium. The biggest hurdle will be the $5.5 million that Farnsworth is owed for next season. In order for the Yanks to get anything back in return they will have to eat a large portion of that salary. How much they are willing to absorb will effect this entire deal, whether or not it goes down and if they’ll actually get a player worth mentioning back in exchange. As a Tiger Farnsworth may have been at his best. He threw 42.2 innings in 46 games sporting an ERA of just 2.32 with 55 strikeouts and opponents hit only .192 against him. For more NY Sports always go to Hot Stove NY.